I’m sure most people know the news by now: former Yankees pitcher Hideki Irabu was found dead, an apparent suicide by hanging. I hadn’t heard anything about it, but a friend asked me “Where’s your Irabu piece?” and I had no idea what he was talking about. So I googled him, and I discovered the shocking news. It’s funny: I vaguely remember watching baseball in 1998 and 1999, I was like 5 or 6 then, yet I don’t have any memory whatsoever of Hideki Irabu. Even so, this is a tragedy that really saddens me. No one wants to hear these kinds of stories. And even though I didn’t have a special connection with Irabu and never saw him play, Irabu was once a Yankee and will always be part of the Yankees family – which is my family too – so this news is very upsetting. In his Yankees days, Irabu never lived up to the great expectations people had of him. Even so, he was a pretty influential guy, helping to break the ice for other Japanese players. I feel like most Japanese players that come to America are a little disappointing. Dice-K was a big waste of money, Akinori Iwamura and Kaz Matsui were never that great, and let’s not forget Kei Igawa of the New York Yankees Scranton Wilkes-Barre Yankees. When the Red Sox signed Dice-K, the Yankees got Igawa. As much of a disappointment as Dice-K was, Igawa was 10 times worse. He could never do it in the Bigs for the Yanks. But even though he sucked, I just couldn’t hate him. He seemed like a really nice guy, and I always laughed at how he’d always be running around Yankee stadium. My family and I joked that if he didn’t make it as a pitcher, the Yanks could use him as a pinch runner! The best Japanese players I’ve had the honor of watching are definitely Ichiro Suzuki, whose rookie card is one of my most prized cards, and Hideki Matsui, who won the 2009 World Series for my guys. These guys were legit superstars. They were even better that I expected. I think maybe I’ve held all Japanese players to standards that were just too high – Ichiro is one of the best players to have EVER played baseball in the Majors, in my mind he’s a no-doubt first ballot HOF – so is it really fair to expect all Japanese players to be like Ichiro? It’s always exciting to hear about international signings. Even if the players don’t always live up to expectations, it’s still fun. Baseball has come such a long way, and it is truly a global game now. I hope its popularity continues to grow around the world. It’s such a wonderful game, why should it only be America’s pastime? With the trade deadline ticking closer, I’m wondering what, if anything, my Yanks will do. 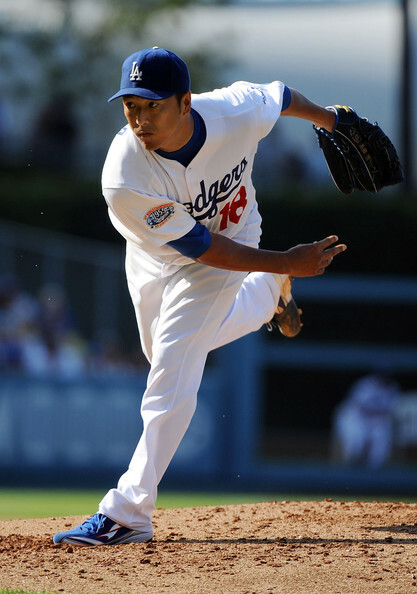 I heard rumors involving Hiroki Kuroda…we’ll see what happens! -Sigh- It’s over. All of it. The championship, the season, the parade, it’s all over now. And I couldn’t be more proud. Sorry I waited so long to cover this amazing story. But I think now I might be able to think about it without crying. The game itself was great. Andy Pettitte just did what he always did and pitched brilliantly. Joba Chamberlain came out of the bullpen with that fire that made him so dominant back in 2007. And what about Damaso Marte? He really was something else this posteason. In that game 6, he faced two batters: Utley and Howard, and struck them both out on three pitches. After Marte got one out in the 8th, I knew what was coming. I heard that song, you know what song, and I started to get a little bit excited. When Mo comes in, you know it’s over. 5 outs? No problem. The Yankees scored 7 runs in this win and 6 of them were courtesy of Hideki Matsui. The other was from an RBI single by Tex. And doing off Pedro? Priceless. Wow. 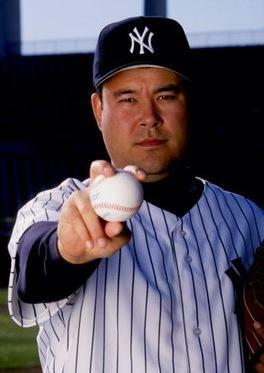 This could have been Hideki’s last game with the Yanks. I sure hope not. But if so, great job, Godzilla. You will always be remembered, Mr. World Series MVP. I cried three different times during this game. The first time was when Mo entered the game, because I knew we were going to do it. The second time was when Victorino hit that pathetic grounder to Cano, who fired to Tex for the final out, which led to the celebration. The last time was during that video at the end of the postgame with that “Empire State of Mind” song by Jay-Z with the images of the Yankee postseason. It just reminded me of what they did to get here. And it reminded me that it is all over. The Yankees did it. They did it all. And no one can take that away from them, or from me. Just look at them! Like little boys…. Okay I was wrong. I can’t think about it yet without crying. I don’t think I ever will be able to. I mean, they did it. THE YANKEES WON THE WORLD SERIES. I don’t have to worry about when I stole that pen anymore. The curse is over. No more worries about Alex Rodriguez or CC Sabathia in the postseason. Everything is perfect in the world of Yankee fans. One thing is very sad. The parade was the last time that this great, magical team will be together. Some guys are going to go. It’s sad. I love this team. More than I have ever loved anything. I’ve been with them for the whole ride. It is going to be very hard to say goodbye. Yankees, I want to say thank you once again. But I think you know by now. I’ll make this quick: I love you all so much. You gave me a great season, a season I will never forget. And I will never forget this special team. Thank you for making my dream come true. I’m getting excited. I can’t help myself. The Phillies have won 11 of their last 12 postseason home games, and the Yankees beat them last night! No matter what, the Yankees will not lose this series on the road. Game 3 was a great game. I didn’t do anything for Halloween, it was just my quintessential Saturday: watching my Yankees win. What could be better? The Yankees beat the Phils 8-5. Pitching Analysis: Andy Pettitte started last night, and he did a pretty good job. He went 6 innings and allowed 4 runs on 5 hits, and struckout 7. He had a rough 2nd inning in which he allowed 3 runs. Werth homered, the bases became loaded and he walked in a run, and the Victorino got a sac fly to give the Phils a 3-0 lead. Andy served up another solo shot to Werth in the 6th. Another postseason win for Andy. The so-called “shaky” bullpen was not shaky last night; in fact it was quite solid. I have to admit, I was nervous when Joba came out to start the 7th. But he really did a nice job, pitching a 1-2-3 7th. In the 8th, it was Damaso Marte’s turn, the only reliever besides Mo whom I had confidence in. And he really dealt. He pitched a 1-2-3 8th, and struckout 2 of 3 hitters. Phil Hughes started the 9th. He got 1 out, but then served up a solo homer to Ruiz. I don’t know what to think about that. I mean, they had a 4 run lead, so I don’t blame him for throwing strikes. But when he was good, he threw strikes and struck everyone out. I don’t know. Anyway, after allowing that homer, Hughes was pulled for Mo, who got the next 2 guys out to nail down the victory for the Yanks. Offensive Analysis: The offense did explode last night, but it took the Yanks awhile to get something started off Hamels. Finally in the 4th, a rally begun. The Yankees were down 3-0 at the start of the inning. Mark Teixeira drew a seemingly-innocent 1 out walk. Then the big man game to the plate. Alex Rodriguez, who was previously 0-8 in this World Series, looked to provide a spark for the Yanks. He hit a ball deep to right that was heading out, but it bounced back into the park in an odd way. I thought it was a homer, but they said it was a double. The Yanks asked for instant replay, and the umps correctly ruled it a homer. Yay! 3-2 now. In the 5th, the Yankee bats were loud. Nick Swisher led off with a double. I think it is safe to say he broke out of his slump last night. Melky Cabrera then struckout, and I was like “Darn, Melky, now Pettitte has to bat. Way to strand the runner.” I spoke too soon. Andy Pettitte smashed a solid single up the middle, which scored Nick Swisher! An RBI single for Pettitte? Hey, I’ll take it! And a funky, awkward slide by Swish. The Yanks weren’t done yet. Jeet singled, and Johnny Damon drove in 2 more runs with a double! That gave the Yanks a 5-3 lead, a lead that they would never give up. The Yanks added on 1 run in each of the next 3 innings. In the 6th, Swish hit a solo homer to give his team a 6-3 lead. In the 7th, Jorge drove in a run with an RBI single to make it 7-4. And in the 8th, Hideki Matsui came off the bench and hit an opposite-field solo homer to make it 8-4 Yanks. It was nice to see some extra runs. This game was pretty exciting. The Yankees were down 3-0, and wound up coming back and winning 8-5. The heroes for this well-played game are Andy Pettitte, for pitching nicely and for being clutch with the bat, Nick Swisher, for coming out of his slump, and Arod, for proving that he is not slumping and for proving wrong the stupid FOX announcers. Haha. It’s Ryan Howard who stinks. He was 0-4 with 3 K’s last night. He’s a bum. Great job, Yanks. We are so close!!! The closest we’ve been in years!!!! AAAHHH!!! Lemme see this 2 more times!!!! That’s comforting. Game 1 seems so far away now that we’ve won game 2. Now my boys head to Philly with the series even. But they have the momentum now. My babies won game 2 3-1, and it was a great game. Pitching Analysis: A.J. Burnett in a big, BIG game? Most Yankee fans were a bit worried about that. Honestly, I was a teeny-weeny-bit nervous about A.J. But after the first pitch, those nerves were gone. I mean it. When I saw him throw his fastball for a strike on the first pitch, I knew I was going to see the good A.J. And boy, was he good! Burnett went 7 innings and allowed just 1 run on 4 hits and 2 walks, while striking out 9 Phillies. The Phillies looked as lost at the plate against Burnett as the Yanks did against Lee in game 1. A.J. was that good. He deserves a ton of credit. I love how the FOX announcers didn’t give him any. Eff them. Mariano Rivera was called upon to get the 6 out save, and I don’t blame Girardi for doing that. I don’t trust anyone in the Yankee bullpen right now. Mo did a nice job. Defensive Analysis: Great defense last night. My favorite play was in the 4th. Jayson Werth led off with a single. I hate Jayson Werth. I think he’s gross. He looks like a goat. No, he looks like that wrestler Edge! Maybe that’s why I hate him. Anyway, he was on first. Molina decided to show off. He made a snap throw to Tex, who made the tag on Werth for the out! Haha, Molina caught him sleeping! It was so cool. Werth looks like he’s gonna spank Tex! How dare he?! Offensive Analysis: That play by Molina may have sparked something in the Yanks. Mark Teixeria led off the inning with a solo homer into the Yankee bullpen. Then in the 6th, Matsui hit a solo homer to give the Yankees a 2-1 lead! Haha, Pedro, who’s your daddy now? Oh, yeah, it’s still us! The Yanks added on another in the 7th. Posada knocked in a run with a pinch-hit RBI single. That made it 3-1, and that’s how it ended. I liked this game better that game 1. Game 1 made me angry….very. Winning is a good thing. The heroes for the victory are A.J. Burnett, for beasting, Mariano Rivera, for preventing the stinky bullpen from pitching, and Mark Teixeira, for his homer and for just being adorable. And speaking of Tex, he reminds me of someone…. Game 1 Of The ALCS Is A Yankee Victory!!! Yes. Yeeeeeees. YEEEEEESSSS! This series couldn’t have started in a better way. GOD, am I happy! I watch the game last night, but in the back of my mind I kept thinking about the PSAT, wondering if I should be looking things over for it. But I couldn’t. I just couldn’t. I didn’t want to do anything but sit there on the lucky right side of the couch and watch my babies. So that’s what I did. And they won. My Yankees beat the Angels 4-1. Pitching Analysis: CC Sabathia, our expensive ace, was FABULOSO last night. I was worried that the brisk, chilly air would effect him. He heavily depends on his changeup as one of his finish pitches. But I had no need to worry. CC was beyond great, and he kept the Angel hitters off balance all night long. CC went 8 innings of 1 run ball, allowing just 4 hits, and striking out 7. Yesterday I had an art sketch due. Guess what I drew? CC! It looked awesome. I got a 99 on it (my art teacher never gives 100’s because he says no one is perfect). I think that is partly why he did so well last night. I LOVE YOU, CC! Mariano Rivera pitched a scoreless 9th, nailing down a save, and the win for the Yanks. Defensive Analysis: The Yankee defense was very good last night. In the 6th, Johnny Damon made a lovely sliding play on an Abreu liner. Johnny seemed to have turned things around in this game 1 with his bat, too. Offensive Analysis: The Yanks jumped out to an early lead in the 1st. Arod knocked in Jeet on a sac fly. With 2 out, Matsui popped on up to shortstop between Figgy and Aybar. When Matsui hit that, I was like, “Ugh. Matsui! Why’d you do that?” But I didn’t have to scold Matsui after all. For some unknown reason, neither Aybar nor Figgins caught the ball! It fell right in front of Aybar, and Damon scored, giving the Yanks a 2-0 lead! Sloppy “D” from the Angels? Wow. I guess it was too cold for them. A cheap RBI. I’m sure he’ll take it. The Yanks added a run in the 5th and 1 in the 6th. Matsui had another RBI and Jeter had one. That made it 4-1, and that was the final score. I had no need to worry even a little about my Yanks. And I guess I didn’t have to worry about the PSAT either. I took it this morning. I grudgingly woke up at 6:30, on my Saturday, and was at the school by 7:30. My proctor was my history teacher from last year. He went to this game. Lucky guy. Anyway, the test was…okay. I survived. It was 5 sections: 2 critical reading, 2 math, and 1 writing skills. The first 2 sections were hard, but it got easier. Whatever. I don’t find out my results until December, so I don’t have to worry. Tonight, I can sit back, relax, and (weather permitting) watch my boys go at it in game 2 versus the Angels. The heroes for the game 1 victory are CC Sabathia, for his stellar performance, Hideki Matsui, for his 2 RBI, and Johnny Damon, for breaking out of his slump with 2 hits and a defensive play.